A film that begins with a dream sequence, and ends up like a nightmare that, thankfully, you forget right after you wake up. It’s a rare occasion these days that I remember a nightmare. Whenever I do have a particularly striking nightmare, though, I resolve to write it down, to try and express all those limitless horrors I’d experienced within the confines of my mind. For some, like say H.P. Lovecraft or H.R. Giger, discomfiting dream-images have been the source of great artistic works of horror. For me, it hasn’t quite panned out that way. The thing about nightmares is that they can be deeply solipsistic – terrifying in the moment, but not necessarily objectively scary, and not fodder for a compelling story. 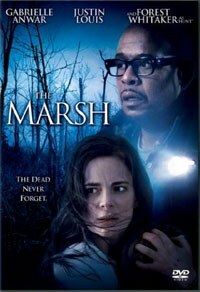 This fact probably should have been explored before the filming of The Marsh, a film that begins with a dream sequence, and ends up like a nightmare that you forget right after you wake up, leaving you with nothing but the sensation that whatever you just experienced didn’t make much sense. The Marsh opens with Claire Holloway (Gabrielle Anwar), an author of a series of frightening children’s books, the most recent of which is “The Swamp”. Claire is then shown in the midst of a nightmare. She runs away from a house, and into a swamp, possibly a bog, more than likely, the film’s titular marsh. She bumps into a teenager dressed in full hillbilly regalia, and she lets loose with a titanic, effects-processed scream. The sound mixing guys really nailed it on the scream; it has a kind of trebly, metallic timbre to it that sounds convincingly nightmarish. However, a pasty teenage yokel in a trucker hat just isn’t that scary. Granted, it was scary I was in high school and there was a legion of dudes dressed like that who would skip class for the first day of bow-hunting season, and but it wasn’t scary in a horror movie kind of way. At any rate, having a heroine come face-to-face with some goofy looking goon is no way to kick off a horror movie, no matter how much foggy fanfare surrounds the scene. Though a lot of the film is groan-worthy, for Claire, the treacherous marsh and a lot of the trite, time-worn horror conventions it is surrounded by are no laughing matter. After a trip to a therapist, and in what could very well be the mother of all coincidences, Claire is watching the TV, and comes across a program that shows a house so uncannily familiar that she must run a Google search on it. The house that she happened to catch on TV turns out to be the one that she’s been using for inspiration in her books, and the house happens to reside in a small town called Marshville. Marshville. Good thing no one stressed themselves over coming up with that name. Claire heads to Marshville in search of answers, and finds them, though they rarely make sense. The quaint little town is inhabited by a host of archetypical haunted house movie rubes. There’s the concerned yet humble rancher, who warns of strange doin’s while renting Holloway the haunted “Rose Marsh Farm” house (in this case, she is also apparently the only other woman in the entire town). Soon thereafter, Claire bumps into Noah Pittney (Justin Louis), the educated townie who inexplicably returned to the land of his birth to chill with a bunch of bumpkins, and who wants to mate with her like no other (probably due to the aforementioned conspicuous lack of women in Marshville). In the midst of an inexplicable power outage, Claire ventures into her new basement, which is brimming with creepy farmhouse knick-knacks, and beneath a curtain finds a stained-glass door. She touches it, has a paranormal experience, and decides to have Noah come over and help her put it up in an empty doorway. On their way to discovering the truth about Claire’s nightmares / memories / whatever-they-are, Hunt and Claire find even more horror conventions. There’s black goop dripping out of faucets a’la The Amityville Horror, there’re townies guarding a horrible secret, and there’re high school kids partying-it-up like something out of an anti-drug PSA, completely with echoing laughter to indicate Reefer Madness levels of intoxication. Hunt reveals that the recently-installed door is probably the key to the increased severity of the hauntings, but never is it suggested that Claire take it down. Noah starts appearing whenever his name is mentioned, and is clearly trying to frustrate Hunt and Claire’s truth-finding ambitions. Claire realizes her link between her nightmares, the hauntings, and the big secret the town-folk are keeping, and the secret, revealed, isn’t all that compelling. You see, the ghost of the little girl by whom Claire is plagued was molested and killed by the older ghost, who was subsequently killed by her twin sister hiding in the closet, who was none other than a young Claire. Somewhere, hiding deep within The Marsh’s muddy plot, is the idea that sexual abuse leaves a miasmic mark on all those who were near the crime. By the end of the film, though, the plot holes are so gaping that they leave more of an impression than any intended message. If everybody in the town was aware of Claire’s identity, and was hell bent on hiding the town’s secrets, why would they let her rent the house in the first place? If Claire, as a six-year-old child, already murdered her twin sister’s slayer, why do the townies find it necessary to keep either of the crimes a secret? Why would Noah suddenly switch from courting Claire to trying to kill her for knowing ‘too much’ when her knowledge of either murder from years ago wouldn’t get anyone involved with the crime in any sort of legal trouble? By the end of the film, Whittaker’s inexplicable appearance as an occult investigator in a small Northeastern farm town is probably the most believable element. The Marsh does have a few moments that’ll make you jump, though only as an instinctual response to quick cuts intended to shock. Most of the parts that are meant to be horrifying in a more extended way are silly, at best. The person renting Claire the farmhouse (who we know is in on the secret) ends up standing nez a nez to an angry horse, gets knocked over, and as she struggles on the ground, the little girl ghost walks across a rafter, stomping her feet ominously, causing a hanging collection of miscellaneous sharp things to fall down upon the woman. In The Marsh, even the ghost of a six-year-old isn’t that realistically characterized. The most compelling part of the movie is Anwar’s midriff. Though granted, the midriff in question looks like something hand-crafted by an ancient Greek god and bequeathed unto humanity, its brief appearance hardly constitutes enough T&A to make a movie this goofy worthwhile. There’s no director commentary on the DVD, though there is a “behind the scenes” features in which the producer, director, and actors discuss their experiences making the film; nothing all that exciting. At the tail end of the “behind the scenes” section, there’s even a little bit where the films’ stars discuss their individual takes on “the supernatural”; even less exciting. I had a dream the other night that I was sitting in a theatre in 2003, watching a horror movie that was thrown together by a major studio just for the sake of doing a genre film, with no real interest in the genre. A few big-name actors were thrown on the cast to allow for a decent PR push. I woke up screaming, and though I couldn’t quite remember what happened in the film, I had this intangible feeling that it stunk to high heaven. The movie in my dream was Gothika. Then I popped in the DVD for The Marsh, and my nightmare came rushing back to me. Like my memory of the details of the profoundly unremarkable Gothika, though, so too shall fade my memory of The Marsh.